For those of you newer to quilting, crafting, and 21st century fabric sales, there are a few names in the industry that are worth your time to know. Michael Miller is a manufacturer based out of New York, and as a company is known for their funky and light-hearted prints. They also act as a converter of cotton fabrics; this means they are the sales front for fabric designers, and offer those designers’ collections to wholesale accounts such as clothing manufacturers and retail fabric shops. This particular print is a Michael Miller original, and comes in four colorways. My preference is the lime, since I’ve been on an aqua/lime/royal blue kick for months now, and because I like the way those colors POP against the chocolate background. Check the link in the sidebar to head over to the Whipstitch Fabrics Etsy shop if you’d like to pick up a little by the yard, and always feel free to leave comments below! 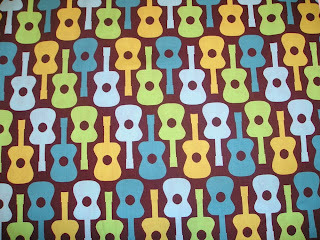 I would like to order either 5/8 yard or 1 and 3/8 yards of Groovy Guitars Lime. What is your cost? What is postage? Please reply to my question regarding Groovy Guitars at my e-mail of meovergaard@gmail.com. Do you use this reply e-mail.